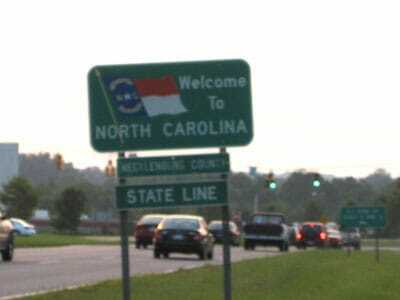 Carowinds is a large park located on the border between North and South Carolina, and indeed one of its coasters takes advantage of the geography as the only ride in the united states to cross a state boundary. My plan for the day had us meeting Wes at this park, an interesting challenge given that we'd never crossed paths in real life. However, previously agreed t-shirts helped here, and moments later we reacquired Mary, James, and Andrew. 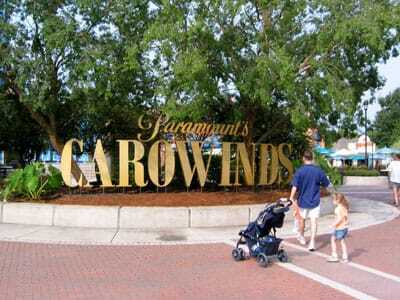 Every park chain has what for want of a better term I'll describe as the poor relation, and Carowinds holds that debatable accolade in the Paramount chain. Though the park does have a substantial number of roller coasters, it has to be said that most of them wouldn't win any awards. In fact, only one of the coasters here today was worth a second go, though to be fair it was sufficiently good to make up at least in part for some of the dross. The first of these was Ricochet (#188), a bog standard wild mouse, without the extra drop at the start seen on the model two days ago. There are some coasters worth cloning, but the Hurler (#189) was not one of those; we didn't think much of the one at Kings Dominion, and we didn't think much of the one here. However, the Carolina Cyclone (#190) was somewhat more interesting, not least due to it being Wes' first inverted coaster. The real gem was the fact that its corkscrew element passes directly over the park midway, something that provides exciting visuals for both riders and observers alike. It'd be nice if more parks did this sort of thing; the only other example I've seen is that at Cedar Point. One quick lap on the Carolina Goldrusher (#191) brought us over to the park stand-up coaster. Various parts of me were still smarting from the awful Togo ride two days ago, but the idea of another coaster overruled my worries. Fortunately Vortex (#192) was built by a manufacturer that knows how to engineer smooth steel, and as such it was a lot of fun. The whole genre of stand-up coasters hasn't been hugely successful over the years; if the early models had ridden as well as the later ones history might well have been different. Thunder Road (#193) makes no secret of its accolade as the only coaster in the United States to cross state lines. It is a two track affair, with one side facing forwards and the other backwards. On balance the backwards side did more for me, though the whole experience suffered somewhat due to the trains being dispatched out of sync. Racing coasters should be raced! It never ceases to amaze me how some family coasters can be so rough. Rugrats Runaway Reptar (#194) was quite uncomfortable to ride thanks to continuous juddering throughout the course. It was actually considerably more shaky than Scooby Doo's Ghoster Coaster (#195), and the latter is made out of wood! One quick credit whore stop on Taxi Jam (#196) brought us to what we fully expected to be the best ride in the park. Top Gun (#197) is a superbly designed inverted coaster that demonstrates conclusively that one doesn't need to build a stupidly tall ride to end up with something that is fast and thrilling. The layout features two underground tunnels, one of which is filled with mist (ala Nemesis Inferno in England). We took two rides on this, both of which were in the front seat. In between our two rides, the coaster broke down, and several people were evacuated from the train from its location on the top of the lift hill. Walking a lift hill is something I've wanted to do for several years, but it wasn't to be today; maybe next time! Wes had to leave at this point, so after saying goodbye James, Andrew, and myself went over to the final coaster in the park, the Flying Super Saturator (#198). This is indeed a coaster but it does stretch the definition a bit; each rider is equipped with a water bomb that will dump several gallons of water on people below. Those on the ground can retaliate with large water guns. Needless to say all passengers get utterly drenched on this ride, but it is great fun. If the weather had been a bit warmer it would have been nice to ride a second time. However, the sun had gone in for the night, so we decided to call it a day.